4 Blade; 20 inch Condenser Fan Blade used in Arcoaire; Heil; Intercity Products (ICP); Tempstar equipment. 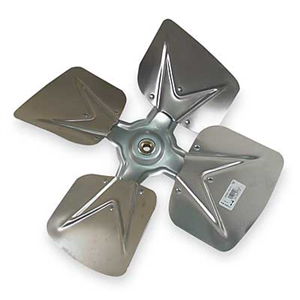 Technical Specifications: 4 Blade; 20 inch; 1/2 inch Bore. Replaces Part Numbers: 1099656; 1080790. Used in Arcoaire; Heil; Intercity Products (ICP); Tempstar Models: PA5536AHA1; PA5536AHA2; PA5536AKA1; PA5536AKA2; PA5536AZA1; PA5542AKA1; PA5542AKA2; PA5548AHA1; PA5548AHA2; PA5548AKA1; PA5548AKA2; PA5548AZA1; PA5560AHA1; PA5560AHA2; PA5560AKA1; PA5560AKA2; PA5560AKA3; PA5560AZA1; PA9524AKA1; PA9524AKA2; PA9530AKA1; PA9530AKA2; PA9536AKA1; PA9536AKA2; PA9542AKA1; PA9542AKA2; PA9548AKA1; PA9548AKA2; PAAA30N1K2; PAAA30N1K6; PAAA36N1K3; PAAA36N1K6; PAAA42N1K2; PAAA42N1K6; PAMB30G6; PAMB36G6; PAMB42G6; PAPA36GA1; PAPA36GA2; PAPA36HA1; PAPA36HA2; PAPA36ZA1; PAPA42GA1; PAPA42GA2; PAPA48GA1; PAPA48GA2; PAPA48HA1; PAPA48HA2; PAPA48ZA1; PAPA60GA1; PAPA60GA2; PAPA60GA3; PAPA60HA1; PAPA60HA2; PAPA60ZA1; PAPC24GA1; PAPC24GA2; PAPC30GA1; PAPC30GA2; PAPC36GA1; PAPC36GA2; PAPC42GA1; PAPC42GA2; PAPC48GA1; PAPC48GA2; PGAA30C1K4; PGAA30C1K6; PGAA30D1K4; PGAA30D1K6; PGAA36C1K4; PGAA36C1K6; PGAA36D1K4; PGAA36D1K6; PGAA36E1K4; PGAA36E1K6; PGAA42C1K4; PGAA42C1K6; PGAA42E1K4; PGAA42E1K6; PGAC36D1HE; PGAC42E1HE; PGAD24B1K4; PGAD24D1K4; PGAD30D1K4; PGAD30D1K5; PGAD36D1HA; PGAD36D1K4; PGAD36D1K5; PGAD36D1LA; PGAD36E1HA; PGAD36E1K4; PGAD36E1K5; PGAD36E1LA; PGMD30G0604; PGMD30G0606; PGMD30G0904; PGMD30G0906; PGMD36G0604; PGMD36G0606; PGMD36G0904; PGMD36G0906; PGMD36G1154; PGMD36G1156; PGMD36H090C; PGMD42G0604; PGMD42G0606; PGMD42G1154; PGMD42G1156; PGMD42H115C; PGME24G0404; PGME24G0904; PGME30G0805; PGME30G0904; PGME36F090A; PGME36F115A; PGME36G0904; PGME36G0905; PGME36G1154; PGME36G1155; PGME36H090A; PGME36H115A; PH5536AHA1; PH5536AHA2; PH5536AKA1; PH5536AKA2; PH5536AZA1; PH5542AKA1; PH5542AKA2; PH5548AHA1; PH5548AHA2; PH5548AKA1; PH5548AKA2; PH5548AZA1; PH5560AHA1; PH5560AHA2; PH5560AKA1; PH5560AKA2; PH5560AZA1; PHAD30N1K4; PHAD36N1K4; PYMC30G4; PYMC36G4; PYPA36GA1; PYPA36GA2; PYPA36HA1; PYPA36HA2; PYPA36ZA; PYPA42GA1; PYPA42GA2; PYPA48GA1; PYPA48GA2; PYPA48HA1; PYPA48HA2; PYPA48ZA; PYPA60GA1; PYPA60GA2; PYPA60HA1; PYPA60HA2; PYPA60ZA.